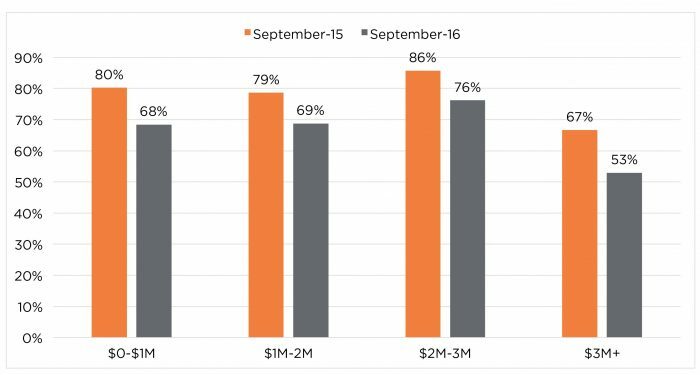 After a relatively slower summer compared with last year, the San Francisco housing market rebounded in the fall. Affordability challenges on one spectrum of the market and geopolitical uncertainty and financial volatility on the other have kept a lid on sales. Homebuyers have become fatigued from the exceptionally competitive market of the last few years and are now approaching the process with more caution and apprehension. They are thus less likely to engage in bidding wars or pay large premiums over a property’s asking price. An increase in inventory of homes for sale is occurring in higher-priced segments and not providing a relief for younger and price-constrained buyers. After the election and with continued pressure on wages, buyers will step off the fence and re-enter the market. Many discussions have surrounded the San Francisco real estate market over the past year, from its extremely low affordability to softening sales this summer to a glut of new condominiums that may cause home prices to fall. San Francisco’s real estate market is a bit more complicated than that, and we’ll dig a little deeper to better explain the current state of the market. As for the Bay Area’s housing market, overall conditions have slowed in 2016 when compared with the last few years. The slowdown is mostly in the number of units sold and buyers’ willingness to compete, while home prices have generally continued to appreciate. The total number of units sold year to date (January through September) in the Bay Area declined by 6 percent. The largest drop was for homes priced below $1 million, which is due to price appreciation and shifting of the price segment into points above $1 million. The number of units sold priced between $1 million and $2 million in fact increased by 7 percent during the same period, while sales of units priced above $2 million fell by about 4 percent regionally. In San Francisco, home sales have also declined by 6 percent year to date, but the slowdown mostly occurred in the first half of the year. 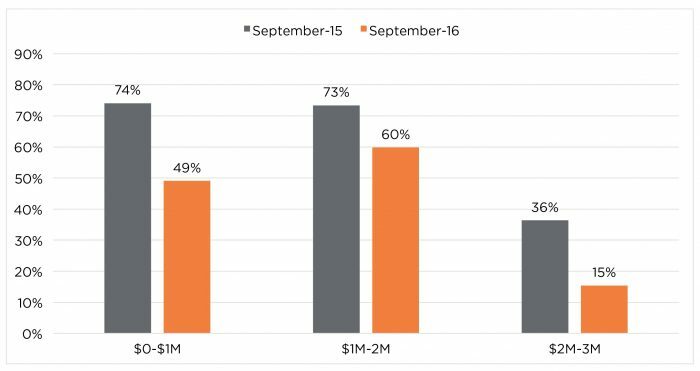 July, too, saw a notable drop in sales, though that trend occurred throughout the entire Bay Area. August and September bounced back and outperformed last year and suggest a promising end to 2016. While there was a uniform decrease in sales of homes priced below $1 million, San Francisco was the Bay Area region with the highest drop in homes priced between $2 and $3 million. Furthermore, the sales decline was even larger among condominiums in the same price range, down by 24 percent year to date. The majority of the decrease is driven by a large drop in sales in March and April from the same period last year, when sales in that price segment were unusually high. Figure 1 illustrates decrease in year-to-date sales by price range in San Francisco. Source: Terradatum, Inc. from data provided by local MLS. And although the sales slowed generally, inventory challenges and demand pressures varied across price ranges. The drop in sales in the lowest price segment is largely driven by price appreciation and inventory moving into the higher range — above $1 million — but also a lack of inventory in the lowest price segment, which has declined on average 3 percent so far this year. Low affordability, along with many potential homebuyers reaching their ceilings, will continue to keep a lid on future increase in sales among the most affordable group of homes. On the other hand, higher-priced segments had more homes for sale than last year. The second two price segments saw an average 30 percent increase in inventory year to date, while the most expensive segment — more than $3 million — saw supply grow by 17 percent. The buildup in inventory was due to many large new condominium projects hitting the market According to data from The Mark Company, inventory of new construction has also increased by about 30 percent on average year to date, with the majority of the uptick occurring since May. Despite the new inventory, however, San Francisco’s housing market is vastly undersupplied. Click here for a recent in-depth analysis on San Francisco’s condominium market. Keep in mind that condominiums have comprised 60 percent of total home sales in San Francisco year to date. Nevertheless, despite more inventory, slowing of sales in the higher price range was caused by greater caution among buyers and an unwillingness to engage in bidding wars. The year started off with uncertainties in the financial markets, followed by the Brexit drama, many economic uncertainties, and the election season. All of this had a cooling effect on the potential buyers of higher-priced homes, who decided to take a pause. Slowing of buyer frenzy is especially evident in declining market competition. 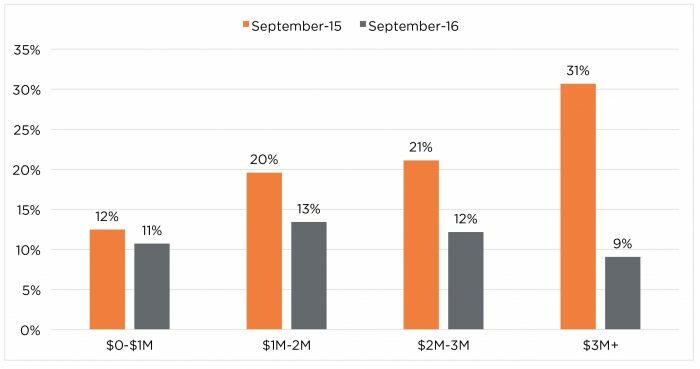 For example, Figures 2 and 3 illustrate the share of listings that sold over the asking price in September of this year and last September. Among all residential units, fewer units sold over the asking price across all price ranges. 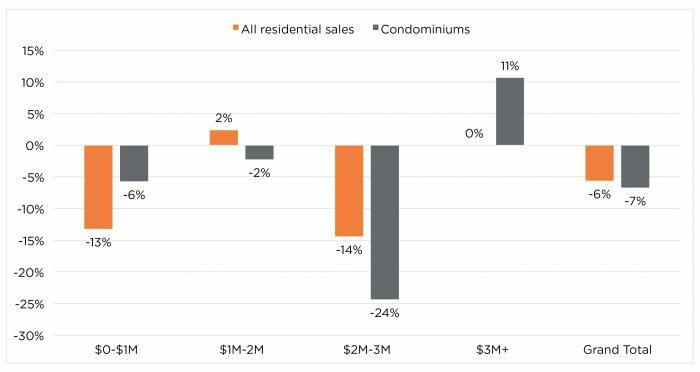 The decline is even more evident among condominiums, where now only 15 percent of homes priced between $2 and $3 million sell for more than asking price. Furthermore, the premiums paid over the asking price has fallen notably. Figure 4 illustrates the change in premium across the price ranges from last September. Homes priced above $3 million had the most dramatic drop in multiple offers, with premiums falling from 31 percent to 9 percent. Slowing buyer frenzy has been anticipated given that appreciation rates of over 20 percent that persisted in the market over the last three years were not sustainable. As a result of this frenzy, annual appreciation rates are now basically flat — at the same level as they were a year ago. This may be welcome news for San Francisco buyers who have gotten discouraged with the homebuying process and can now approach it with less urgency. Also, stabilization of price growth enables potential buyers to have a more predictable homebuying experience. All of these housing-trend developments are signs of a normalizing market, in which the relationship between buyers and sellers is more balanced than it has been in the last few years. Going forward, we anticipate the market to continue at the pace we have seen this year. After the election is over and consumers and businesses resume their activities, there will be more housing-market activity. The Bay Area’s job market is expected remain steady, as venture-capital investment picked up in the second quarter of this year. Also, San Francisco is still greatly in demand by millennial buyers, whose income growth has been relatively stronger and who are reaching the age of starting their own households. To get our San Francisco and Bay Area forecast through 2019, join us for Pacific Union’s exclusive live event with John Burns Real Estate Consulting, to be held on Nov. 16 at the SFJAZZ Center in San Francisco. Contact your real estate professional for more information on attending in person or accessing the live webinar.